Club President, Wendy Vanarsdel, opened the meeting with an invocation, followed by the Pledge of Allegiance. After welcoming guests, she introduced the guest speaker for Tuesday’s meeting, Kirk McCracken. McCracken, a renowned local author, is a 1992 Sapulpa High School graduate and the editor of the Sand Springs Leader. 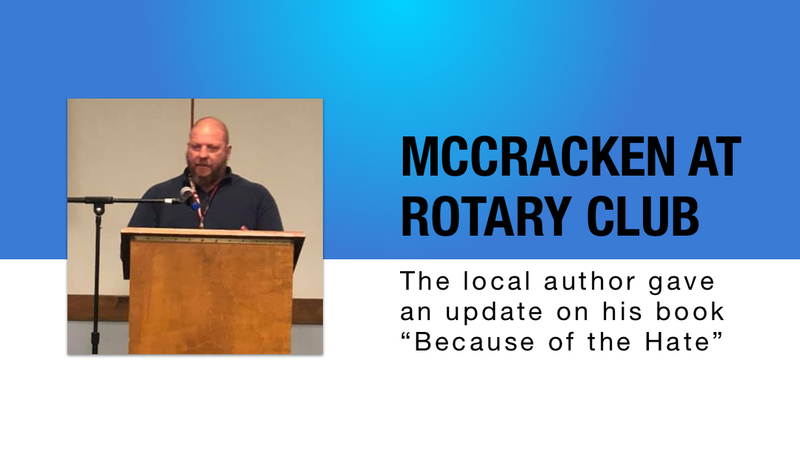 McCracken discussed his recent book, “Because of the Hate,” which was published January 2018. McCracken started out in 2001 as a sport writer for the Sapulpa Herald. He was keenly interested in Sapulpa High School sports records. He found no archived records, so he spoke to Steve Shibley, Sr., then athletic director for Sapulpa High School, and found out was that there were no records kept. McCracken started pouring over newspaper clippings and microfilm. He came across articles related to the murder of Coach Bailey. The articles piqued his interest, in part, because Coach Bailey was from Nowata, as were his parents. His parents and relatives had told stories about the murder when he was a child. It was not discussed much in Sapulpa, out of respect for Bailey’s widow, Beverly, who was still teaching in Sapulpa. McCracken went to Oklahoma City to obtain court records, medical records, and crime scene photographs. Thus began a 14-year odyssey to bring to fruition his first non-fiction work, telling the story of the tragic murder of a beloved coach. McCracken started writing, and gave his first draft to his relatives to read. Their response was that it was a great story but it read like a newspaper article. He put it a way for 10 years, at which time he spent about a year re-writing the entire story. In January 1976, Coach Jerry Bailey and Assistant Coach Paul Reagor, Jr. left the school and did not come back. An exhaustive search found Reagor’s car 24 hours later at a home in Bixby. Reagor was inside and told police that Bailey’s body was in the trunk of his car. McCracken’s meticulous research answers many questions and correct rumors swirling around for decades. This superbly written, true-crime drama is a must read. “Because of the Hate” can be purchased on Amazon as an audio book, soft-back or digital edition. The audiobook can also be purchased at storytel.com and SlideShare.com. The Rotary Club meets every Tuesday at Noon at Freddie’s Steakhouse.